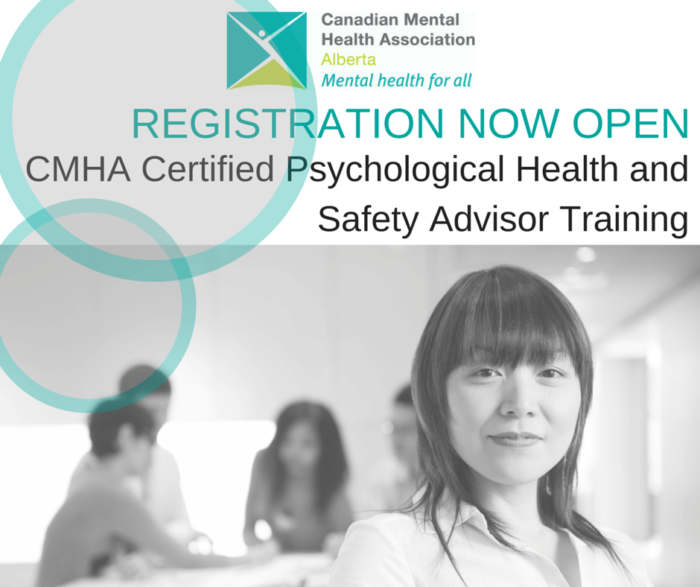 CMHA’s certified Psychological Health and Safety Advisor Training program will help individuals who are working to improve psychological health and safety in workplaces or implement the National Standard of Canada for Psychological Health and Safety in the Workplace (the Standard). CMHA Alberta Division reserves the right to cancel or postpone trainings due to under-enrollment, instructor illness or inclement weather. If a training is cancelled, you may transfer to another workshop or receive a full refund. Refunds will only be provided in the event a workshop has been cancelled by CMHA Alberta Division. Designate a substitute to attend in your place, at no extra cost. Please notify us of the name of the person attending as soon as possible prior to the training date for which you registered. This will allow us to correct our records and minimize confusion at check-in. Transfer to another training session, provided that you notify us by fax or email at least 10 business days prior to the training date for which you have registered. A $20 administration fee will apply and is payable at the time of the transfer request. We will not consider requests to transfer less than 10 business days prior to a training date. If you fail to attend your scheduled training session without required notification, as outlined above, your fee will be forfeited.